Preparations are well under way for the Brisbane Truck Show 2015, with organiser the Commercial Vehicle Industry Association of Queensland (CVIAQ) announcing the signing of major partners for the event. Australia’s premier transport indsutry show is to be staged from May 14 to 17 at the Brisbane Convention and Exhibition Centre. Brisbane Truck Show manager Noelene Bradley says the CVIAQ has renewed long-term relationships with BP Australia as the show’s platinum partner, while Bauer Trader Media — publisher of ATN, Deals on Wheels and Owner//Driver — is again on board as exclusive official media partner. Rugby league legend and TV personality Shane Webcke is returning as show ambassador, while Castrol Vecton has signed on as the show’s first bronze partner. "The CVIAQ is again privileged to have market-leading brands BP Australia, Bauer Trader Media and Castrol Vecton as partners for Australia’s premier transport industry event," Bradley says. BP manager Bruce Jones says the company is delighted to again become the platinum sponsor of the Brisbane Truck Show. "We are excited to see some of the plans being prepared. This will be an outstanding event and provides patrons with the opportunity to see the latest in industry product, technology and the people side including health and careers in transport," Jones says. "Most of all there is networking opportunities for those in transport or simply a spectacular show for those interested in our industry. "We look forward to welcoming you to Brisbane. The calibre of the exhibitors is a terrific drawcard for those directly involved or interested in the industry. "As a platinum partner, the event provides a valued opportunity for BP Australia to showcase our continued investment in our network, comprising truck stops, key diesel and truck-friendly sites strategically positioned across Australia, for the benefit of transport operators and drivers. "It also provides an environment where our executive sales team attending our stand can talk to new initiatives we are involved with and answer any questions. "We are very much looking forward to being involved and demonstrating what we stand for: ‘Good for drivers. Good for business’," Jones adds. For Bauer Trader Media, the re-signing provides further evidence of its commitment to supporting the Australian transport industry. "As Australia’s leading transport and logistics industry publisher, Bauer is delighted to again partner with the nation’s premier transport industry event, organised by industry for industry," Bauer Trader Media general manager of transport and machinery Graham Gardiner says. "The 2013 Show was an outstanding success, with some 37,774 decision-makers and visitors pouring through the gates to witness more than 300 displays of the Australia’s best vehicles, components and transport equipment — all in undercover, air-conditioned comfort. "Most importantly, exhibitors delivered glowing testimonials of the event, citing best-ever sales, leads and networking opportunities and describing it as the best one in its long and proud 45-year history. "Bauer Trader Media looks forward to again partnering with the CVIAQ to deliver another outstanding show." 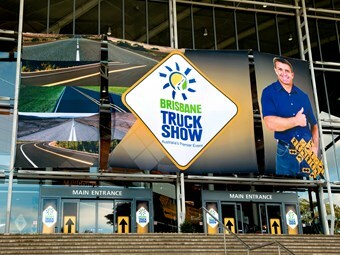 Under the partnership, Bauer Trader Media has exclusive rights to publish the Brisbane Truck Show 2015 Program containing a full preview of the show and exhibitors as well as crucial show information including maps, exhibitor listing and other important details. About 25,000 copies of the program will be distributed to all show attendees at key entry points throughout the four-day event. Additionally, a further 80,000 copies of the program will be distributed to key transport industry decision makers pre-show through ATN, Blue’s Country Magazine, Deals on Wheels and Owner//Driver. Additionally, Bauer Trader Media has exclusive rights to produce and distribute about 20,000 official show bags at key entry points throughout the four-day event. Post-show, ATN and Owner//Driver will publish comprehensive reviews of the Brisbane Truck Show in their June 2015 issues. These reviews will include coverage of the show and key products and services unveiled at the event by truck, trailer, parts and accessories suppliers. "The Brisbane Truck Show is a unique opportunity every two years to highlight and promote products to the largest industry gathering," Gardiner says. "Exhibitors should not miss this chance to showcase their business and services directly to attendees." For all the latest information and sponsorship opportunities at the Brisbane Truck Show visit www.brisbanetruckshow.com.au or e-mail admin@brisbanetruckshow.com.au.